A pastry cream, as its name implies, is one of the most basic types of creams used to make sweet delicacies. With the appearance and taste, it resembles vanilla pudding at first glance, so we could say it is basic, but not boring. This adaptable cream is indispensable for the preparation of princess donuts or eclairs, but it can also serve as a filling for other sweets - such as pies, cakes and donuts, or served separately, with little beaten cream and fresh fruit. How to prepare pastry cream? For a fuller taste and a brighter look, you can add 30 g (2 tablespoons) butter to the list of ingredients, but don't leave out vanilla at all. It is best to use 1 teaspoon vanilla extract, but you can also serve 20 g of vanilla sugar which should be combined with the total amount of 100 g of sugar required in the recipe. Begin the preparation by warming up the milk on slow fire to boiling. 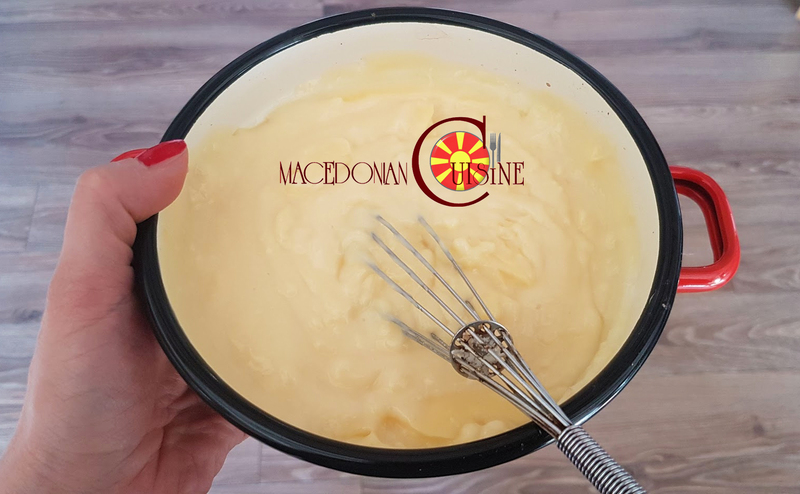 While the milk is heated, mix the yolks and sugar with a wire and add starch flour and stir everything well, ensuring that there are no lumps in the mixture. Don't do this procedure prematurely because the long staying of the starch flour in the yolk can cause their lumping. When milk boils, slowly add it to the mixture with yolks with constant stirring. You can also add just a little hot milk to the yolks first in order to temper them first, and then just start with the addition of the remained milk. But in any case, after mixing the milk and yolks well, bring the mixture back into the pot in which the milk is cooked and cook at low temperature with constant stirring. Then remove the dish from the heat source and, if desired, mix in the butter, and if you have decided to add vanilla flavors in the form of an extract, mix it in well. Dessert cream should not have lumps of starch flour or pieces of cooked yolk, but if something went wrong, you should solve the problem by "passing" the hot cream through a thick drainer. Also, don't cool the cream in the cooking pot, but switch it to a clean bowl, and lay the adhesive plastic foil on top to prevent skin forming during cooling. When the cream is cooled to room temperature, place it in the refrigerator for at least 2 hours, but you can store it up to 2 days. Before use, stir the cream well in order to have as much as possible consistency, and if you want to give it a more breathable texture, mix in a beaten cream.